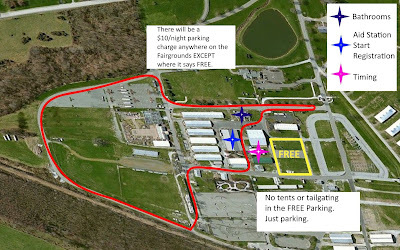 On May 19th, I went to 3 Days at the Fair with one objective: cover enough miles in 24 hours to effectively guarantee a spot on the USA 24 Hour National Team. If I did that, I’d be able to compete at the biannual World Championships held in Austria in 2019. For the 2017 team, 153 miles was enough to secure a spot on the 6-person roster. 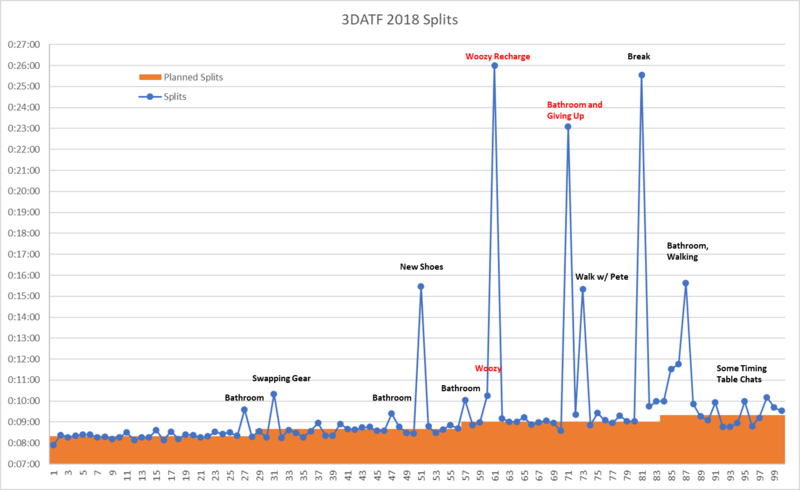 Assessing my fitness and comparing against other successful 24 hour runners, I put together a plan for 158 miles, something I felt I could achieve on a problem-free day. That 153 to 158 window gave me about 5 miles of slack for a couple things to go wrong. That could accommodate a 50 minute deviation from my race plan; something that extreme has never happened before – I take pride in my planning for races at 100K and beyond. So yeah, I was feeling pretty good about my chances. It's not all left turns! The course is a flat loop, exactly 1 mile in length. That meant for this race I didn’t have to worry about sorting out proper aid station splits and accounting for vertical gain/loss. I knew from a couple races in the previous year that I could run 50 miles on rolling, runnable trails at 8:20 – 8:30 average and not feel completely spent. I figured that pace was a good place to start, and then plan to gradually get slower as time went on. I don’t like planning to slow down, but I wanted to be mindful of the fact that I typically train for mountain running which varies the way muscles are activated, as opposed to sustained flat running which uses the same muscle mechanics mile after mile – I know how to prepare for blown quads in a mountain race, but I had no idea what would happen to my muscles after hours of flat pavement. Basically, break the day into 4-hour bins and plan to get slower by about 20sec/mile every 4 hours. I also planned to stop at my personal aid station every 10 miles for up to 2 minutes. That, plus maybe 1 gear/shoe change, would put me right at 155 miles. As the race approached, it became clear that I’d be running in the rain for a good chunk of time. If it were a normal race where all competitors had to deal with the same issues, it’d be no big deal. But I was racing the clock, and competing against efforts posted by other runners at other races with likely better weather. I was concerned, but found it hard to believe that bad weather would cost me upwards of 5 miles in 24 hours. 1 – 3 miles was more likely. So not a deal breaker by any stretch, it just meant not a lot of other things could go wrong. … At this point I would normally dive into an enthralling, captivating, action-packed play-by-play of my race. But I’m gonna take a little different route this time around. SPOILER ALERT: I didn’t hit my mark. I didn’t even run for 24 hours. 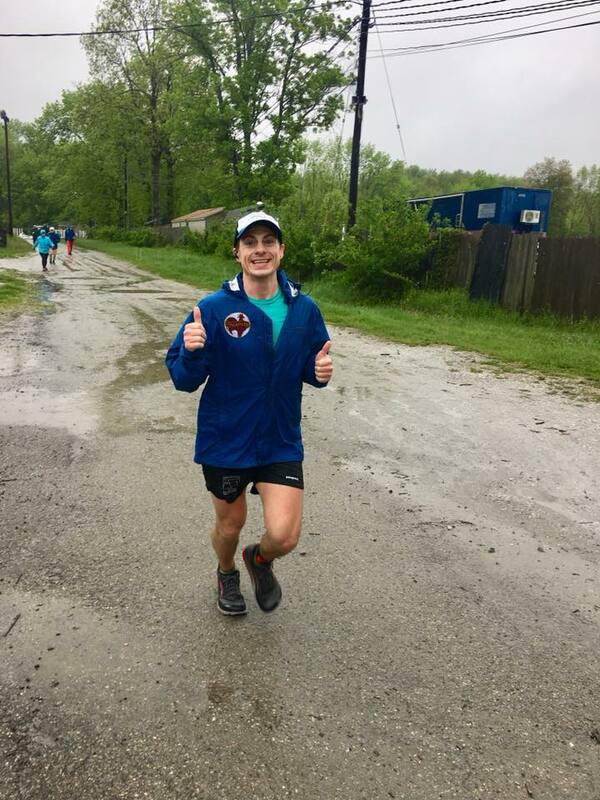 I ran 100 miles in under 16 hours, and then called it quits. Clearly, something went wrong and I gave up. So let’s walk through the issues that led to my failure! The first 3 hours saw persistent rain with temps in the mid-40s and the occasional 10mph winds. It wasn’t that bad; I actually would’ve enjoyed this weather on the trails. I knew the rain would pick up after 3 hours, so I had already planned to stop at some point and put on a dry top and warmer rain jacket. I covered my first 28 miles in about 3:55, on perfect pace. I’d been running the last hour soaking wet and decided it was time to dry off. The process took longer than I would have liked, just to put on a new shirt and jacket. But no harm, no foul. I got right back to running. The real problem the rain presented concerned my feet. Early on, I was obsessed with hitting the best lines, and ran through puddles frequently. More puddles, wetter socks and shoes, and more dirt and grime on my feet. I abandoned that tactic after about 2 hours. 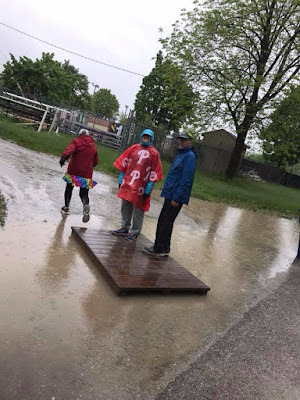 It may sound stupid to be talking about puddles and how they can throw a wrench in your race, but going around them probably cost me a couple seconds each lap, too. Anyways, the bigger issue was that after 8 hours I knew my feet needed some fresh socks and shoes. The 3-hour downpour from hours 4 to 7 had subsided and a long stretch of limited rain awaited me. I ran through Mile 50 just over 7 hours, feeling great and still hitting my planned splits perfectly. But getting new shoes took FOREVER! My feet were sopping wet and there was dirt and sand stuck in between my toes. There was no point throwing new socks and shoes over dirty, wet feet, so I had to diligently clean and dry them first. And just like that, 8 minutes disappeared! 8 MINUTES! Ugh! Since I was still feeling fresh and had just nailed my 50 Mile split, I wasn’t concerned. 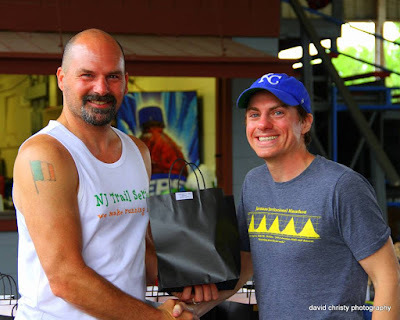 My first 100 Mile race in 2015 was, by all accounts, a success. But I had to jump off the trail a half-dozen times in the final third of the race to go scratching in the woods. I likely gave up 20 minutes because of an upset stomach. After that, I started taking Imodium before all long races. In the 18 or so hours before a race, I will take the recommended daily maximum. Roughly 20 to 40 miles into a longer race, enough pressure will build and I’ll need to poop, at which point I’ll generally take another 1 or 2 doses. That usually keeps my gut in check for the rest of the race. The process has become routine and predictable. So I did the same thing before this race. And starting at roughly Mile 16, I felt the urge to poop. A little early, but whatever. Only, when I eventually tried to go, nothing happened. As time went on, the pressure and pain in my lower abdomen kept increasing, but I still couldn’t go. I periodically tried going to the bathroom in the hopes I could finally clear out my gut. When all was said and done, I tried pooping 6 times, and could never go. Instead, I wasted at least 10 minutes and kept getting more and more frustrated. So what happened? Well, my initial urges to poop in a long ultra are typically coincident with a long downhill stretch of running. Bounding down a mountain shakes up my system and even though I dose up on Imodium, I can still count on enough downhill running to force me to go scratch in the woods. Only, 3DATF was perfectly flat, so no stomach jostling. I basically overdosed on Imodium because I didn’t account for how flat running might affect my stomach differently than mountain running. Also, I’d have apple juice, ginger ale, tea, and chocolate milk lying around if I had a hankering. For the most part, the plan worked. I never felt that nutrition or hydration was an insurmountable problem. I’d planned to swing by my table every 3-4 miles and grab a bottle. I pictured it like those road marathon races – effortlessly swinging by a table and grabbing my bottle. It was gonna be awesome! With my table setup, the reality was that I had to put my table about 5 feet off the course, and the rain turned that 5' stretch into a muddy, slippery hell. Coming into and out of my aid station probably cost me 5 seconds each time. It adds up, but mile-by-mile it wasn’t noticeable, so I’m not going to claim this had anything to do with me giving up. Still frustrating though. 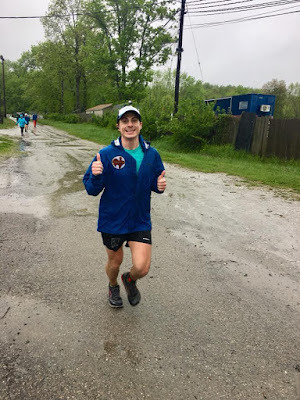 The rain kept me cool and I quickly realized I needed much less liquids than planned, which meant I had to supplement my calorie intake with more solids from the get-go. This probably contributed to my gut problems a little bit. I talked about pooping, so why not peeing?! I overhydrated pretty quickly and felt the urge to pee entirely too often during the race. Normally I don’t pee much in the first 8+ of a race, but for 3DATF I struggled to make it 6-10 mile stretches before stopping. I did a good job adjusting my liquid intake accordingly, but the urges to pee never subsided. Usually, by the end of most 100 Mile races I’m reduced to peeing every 10-15 minutes for only a few seconds at a time because my bladder won’t stop feeling painfully full. On a trail, it’s irritating but not a big deal as it maybe slows me down by 1-2 minutes overall … maybe. But at 3DATF I either had to jump off course to hit up the restroom, or run completely off a good line to hit up a nearby tree. Each time I did that was a solid 10 seconds of unnecessary running. Again, it adds up, but it’s not noticeable in the splits so I won’t say it had any impact on my failure. Like I said earlier, at 50 Miles I was doing great. I lost some time with a shoe change, but I never thought I wouldn’t be able to clear 155 miles. As I started Mile 60, all was good. Legs were fine, nutrition was fine, and I was mentally in the game. A few minutes later, things got scary. I have no idea what happened, and I can’t figure any way to chalk it up to anything other than a random fluke of bad luck, but I felt like I got hit by a ton of bricks and immediately felt woozy and dizzy. I started uncontrollably weaving along the course. My legs felt dead – my muscles weren’t sore, it just seemed like my legs were incapable of moving. I looked at my watch and thought to make it to 62 miles so I could claim 100K in under 9 hours, but as I passed by my tent I knew I had to stop immediately. It felt like I was suffering from vertigo, while drunk and tired. I sat down, told myself I had plenty of time, and I just needed to take a break, down some food, and relax for a few minutes. Don’t press on until this gets sorted out first. I probably took in 800 calories – cookies, potatoes, fruit, Starbucks Frappuccino, PBJ, you name it – in under 10 minutes. I felt kind of silly. I kept picturing those old, beleaguered souls in pictures at Hardrock, etc., camped out in an aid station chair, looking totally wrecked and showing absolutely no pressing urge to start running again. BUT, sitting down and resting felt like it was just what I needed. After about 17 minutes, I hopped up and was on my way again. For the next 10 miles my pace was exactly what I wanted and my legs felt great. The gut issue was still present, but felt manageable still. However, I kept getting distinct shifts in perceived effort. All of my miles were roughly the same pace, but one would feel like a breeze and the next would feel like I was racing a marathon, the next a breeze again, … At 70 miles I felt like I needed to stop again, hoping that would get the weird effort swings under control. A little more than 10 minutes later and I was ready to run again. Only, I knew that I’d effectively bled 40 minutes in a mere 20 miles. Nearly all of my planned slack had disappeared. 158 miles, out the window. 155 miles, extremely unlikely. 153 miles? Only if I could right this ship, and fast. The next 2 miles still didn’t feel quite right, so did a risk assessment and decided to abandon my goal of qualifying for Team USA. Since my muscles still felt fine, I wanted to continue on to 100 miles, but without any rush. I passed by Pete Kostelnick, who was walking at the time, and decided that slowing to walk with him for a while was the perfect way to force myself to quit. From then on out, my woozy/dizzy spell never came back and my perceived effort slowly stabilized with the help of some more excessive rest breaks. Who knows, if I had a crew maybe I would’ve been coaxed into pushing through, having a much shorter rest break, walking instead of sitting in a chair, whatever. But out there by myself, experiencing something I couldn’t explain that came out of nowhere, it rattled me and I opted to play it safe and not put my body on the line for something that had an increasingly small chance of working out. Time eaten up by whatever the hell that was: 17+ minutes for one break, 30 minutes before throwing in the towel. After I gave up, the rest of my run was rather enjoyable. No pressure, totally low key. I didn’t beat myself up or sulk. It was actually quite fun. I still hit the paces I had expected to hit when I ran, but I took extended breaks just for the heck of it, and chatted up some folks and walked whenever I wanted. The final 25 miles I could tell my feet were suffering from maceration due to the wet starting conditions. That would’ve been rough to run through and try to hit 150+ miles. The rain picked back up after 13 or 14 hours, but was fun to run in with no pressure remaining to perform well. I eventually finished my 100 miles in 15:57, and that includes the 70+ minutes of time I wasted. I had to do 101 to get a buckle, so I took my sweet time, got some tomato soup and a fresh grilled cheese sandwich, then walk-jogged that last mile. Afterward, I hung out around the main aid station, had a beer and a burger, kicked back, and relaxed. I took a shower, then headed to my car to log a few solid hours of sleep. I woke up with maybe 2 hours left in the race, packed all of my stuff up, and then checked the standings. Somehow, with an hour left, I was still in 2nd place ... and they gave out awards to the top 3. And, there were 2 guys on their 101st lap, running together looking to overtake me. Convinced by Pete that I should go ask for my timing chip, I threw on some running gear and headed over to the timing station. The RD, Rick McNulty, happily obliged and I went off to run another 7 miles in less than an hour, ruining somebody’s day in the process! Mulling it over the past few days, I’ve found no reason to regret bowing out. It’s probably for the best. 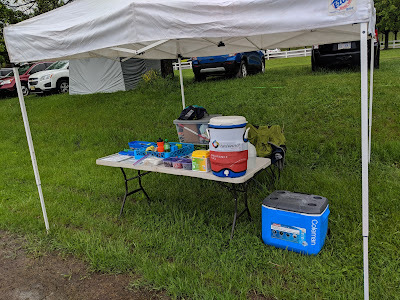 The race conditions were less than ideal, my gut was oddly uncooperative, and that dizzy spell scared the crap out of me (well, I kinda wish it had…). I only ran 60 miles purposefully, so my legs aren’t in bad shape right now. Not trying to push through has probably given me back another 2 weeks of focused training. So now it’s on to a couple months of more enjoyable trail running to focus on Eastern States 100 in August … with the potential for an audible in mid-July to give this 24 Hour thing one more attempt. Stick with the pace plan I devised. It worked well for the first 50 miles and ignoring my excessive rest periods, it held up through 100 miles.